Located in the very popular Myrtle Beach resort, this first floor, two bedroom, two bath condo comfortably sleeps six. The family oriented resort has 24-hour gated security so that your children can be free to play on the playground, basketball and tennis courts. There are six swimming pools, saunas, hot tubs and an exercise room, and New For The Spring a Heated Lazy River all within the 36 acre well maintained property on the beautiful Atlantic Ocean. With 750 feet of beachfront available, your family will have plenty of room to enjoy swimming, fishing, building a sand castle or spending a lazy day lounging on the beach with a good book. Located steps away is a Cabana Bar with ice cold beverages to make your day at the beach complete. It is within a short drive to many golf courses, water parks, restaurants, shopping and other fun attractions. Amenities: First Floor Unit with curbside parking! Absolutely no stairs! Newly redecorated unit and completely furnished, including linens. A full kitchen with microwave, dishwasher, blender, dishes/utensils, and coffee pot, cable TV, a VCR, & a CD Player. Located several yards away is a grilling area, an indoor - outdoor pool, hot tub, sauna, and steam room. Activities: New Heated Lazy River, lighted tennis courts, ocean side pool, indoor atrium pool, heated indoor/outdoor pool, whirlpools, saunas, exercise room, game room, children's playground, outdoor cabana, snack bar and surf fishing. The condo was very nice ,being on ground floor was very nice also the only thing it didnt have was a hair dyer but was not a big deal. Would like to stay again. We are glad you enjoyed your stay, and look forward to helping with your vacation plans in the future. This place was perfect! Very centrally located to everything, no issue at all. We would recommend this to everyone we know! The property was updated which make for a good stay. Thank you for your review. We were glad that we could assist you with your vacation. Several issues, the posting is not accurate. It says very plainly the linen are included but they are NOT. And I was contacted only a week before our stay to inform me so. The unit is not pictured correctly. None of the pictures are right. Both of the toilets in the unit either leaked or broke while there. This place looks like it was updated 30yrs ago. I believe this place has moisture issues as well, judging by the rust on appliances and door hinges. We also had a cockroach crawl up into the tub over night our first night there. We will not be staying here again or probably anywhere in the Myrtle Beach Resort ever again. I asked you prior to your vacation, if you were flying , or driving in, as the cleaning crew did stop handling the linens this season. We discussed that issue, and you did not say that it was an issue prior to your stay. Had you, I would have made additional arrangements for linens, as I have with other guests that could not bring them. As for the unit not pictured correctly, the pictures are out dated. I agree. 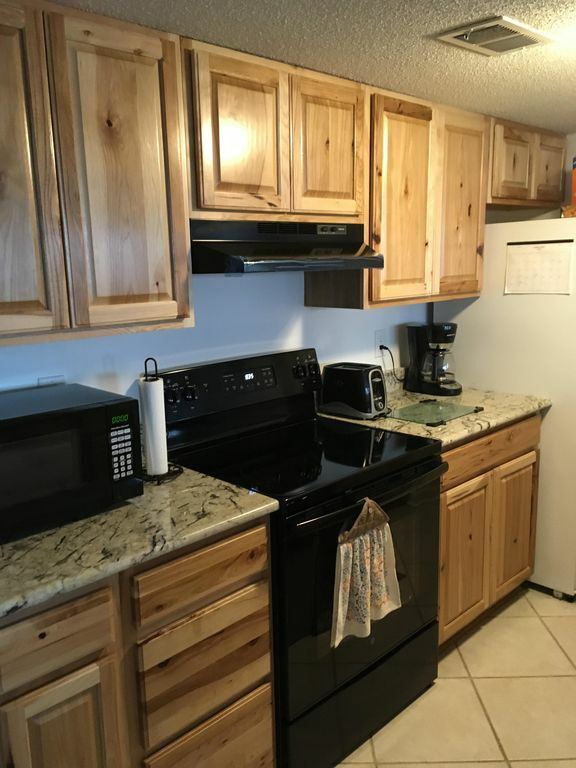 Since the pictures were taken years ago, the furniture has been replaced as have appliances. The condo has been painted numerous times, Older style televisions have been replaced with flat screens, and the carpet has been replaced with tile throughout. Almost everyone considers these things to be pleasant surprised when they check in. I was notified of the bathroom leak the day you were checking in. I immediately called you, and informed you. I asked if you wanted me to address it then, and you said NO. You would let me know if it was an issue. You did not say it was, so I had someone in AFTER you left. The plumber told me the handle on the second toiled was broken, and he fixed that as well. As for rust, the condos are close to the ocean. There are ocean breezes. That does make things rust some. This is the South. There are palmetto bugs through out the South East. It is a fact of life. There is regular pest control service at the resort. That is when you are most likely to see a couple of bugs. Bugs do get in houses all over the world occasionally. Again, a fact of life. To summarize, we spoke prior to your trip about the linens. You were fine with bringing them, but then complain about it after. We spoke about the toilet leak, and you were asked if you wanted a plumber in there to fix it right away. You said NO. Then you complain. A handle breaks when you are there. Thinks happen occasionally. You could have mentioned it, and it would have been addressed, but no word until this review.